I saw "Hail Caesar!" earlier this year. 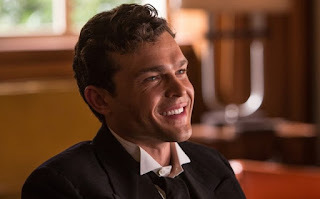 While it became one of my least favorite Coen brothers movie, I was completely taken aback by the work of Alden Ehrenreich. He was easily the highlight of the film and brought some genuine talent and credibility to the movie. I always love discovering a new talent and I liked Ehrenreich almost immediately. It has now been reported that Ehrenreich has received the young Han Solo role in the upcoming anthology film. This film will be released sometime in May of 2018, the year after Episode VIII. I am very excited for the anthology movies, particularly "Rogue One." The reason I am so ready for these is the break from the Skywalker storyline, we are going to see a side of the "Star Wars" universe that we haven't seen yet, and "Rogue One" looks phenomenal. But, I am a little less excited about this solo Solo movie. I mean, if the whole movie amounts to a checklist of past events involving Han, then that will be a deal-breaker for me. I don't need an entire movie telling me how Han met Chewie, how Han obtained the Millennium Falcon, how Han completed the Kessel run, how Jabba the Hut came to hate him...I don't need a whole movie of that. Would it really be a big deal if there were some mysteries left intact? If some of the movie deals in that then okay. But I don't want the entire Han Solo movie to just be a checklist. With that said, at least Ehrenreich will rock the part. I love that we didn't get a full-fledged movie star for the role. We got a new up-and-comer and I bet he will absolutely soar with this part. I just hope the material he is given to play doesn't waste him.